I thought Zelazny really stepped it up on this one. The previous book in the series, Trumps Of Doom, featured a new character as the protagonist/narrator; Merlin, the son of Corwin of Amber, who narrated the first five books. In Trumps, Merlin failed to live up to his father's sheer coolness, and thus that book excited me less than the first five. In fact, the Merlin we meet in Trumps came across as a bit of a chump, and we still see some of that in Blood Of Amber as well(seriously, he can't figure out that the one-eyed, one-eared wolf that hates him and wants to kill him is actually his one-eyed, one-eared shapeshifter brother who hates him and wants to kill him?). However, Merlin decides to try to take control of his own destiny in this book, and in my mind this makes his flaws much easier to deal with, and also helps move the action along at quite a good clip. 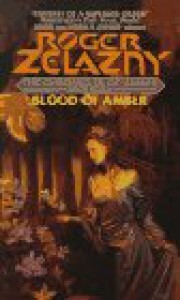 By the end of the book, it seemed that Zelazny had really hit his stride, and things were happening so quickly and furiously that I could barely put the book down. I can't wait to read the next one and figure out what the hell happened with the completely bizzare Alice In Wonderland ending.